Went to the awards dinner of the 29th Annual Bosque Art Center Exhibit last night. What a wonderful treat! The quality of art was so impressive and the warmth of the members of the art council and guest was moving. 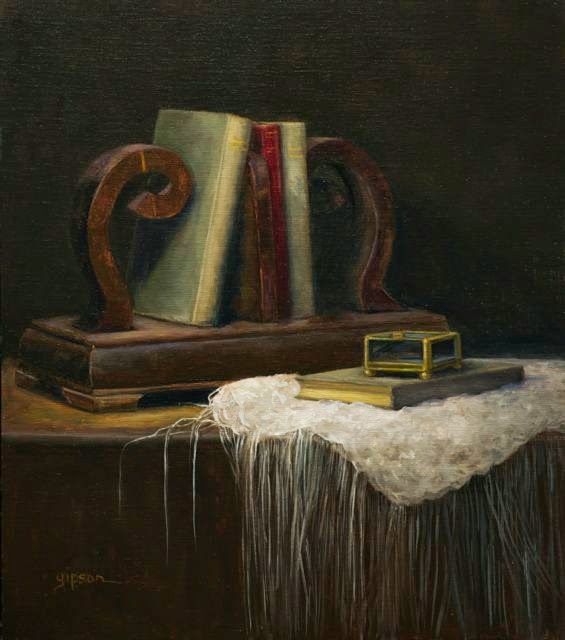 Three of my pieces were juried into the show and what an honor to walk into a crowded room and discover that one of them, "Embroidered Treasure" had not only won the First Time Entrant Award but the Gold Award for the Oil/Acrylic category and it had sold! Another entry, "It's Appealing" had also sold! What a wonderful event and evening! 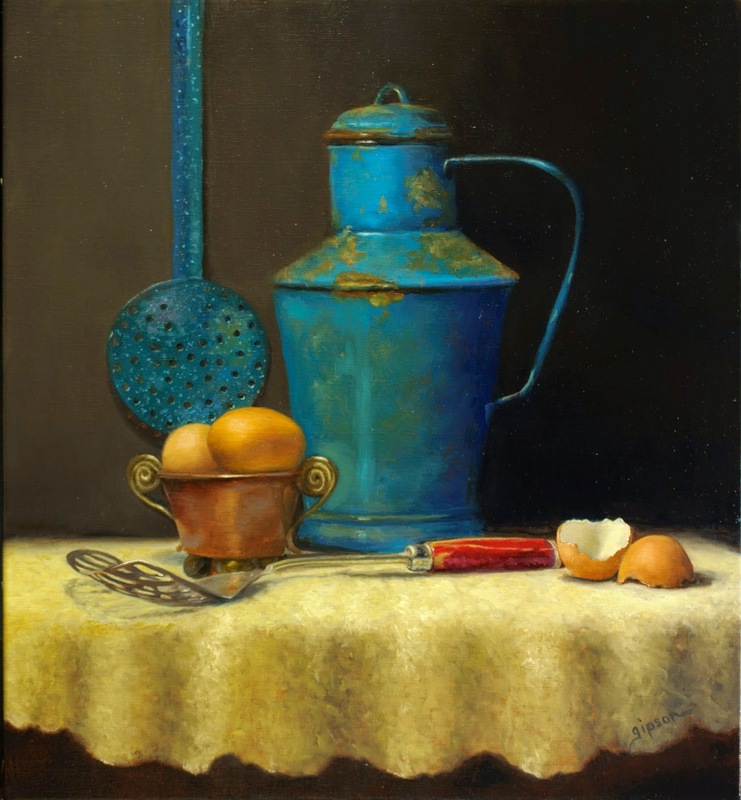 I've been a little delinquent sharing some wonderful things that have happened during this summer - one of which is the selection of "Blue Enamel & Eggs w/Slotted Spoon", to be in the Oil Painters of America Western Region Exhibit! 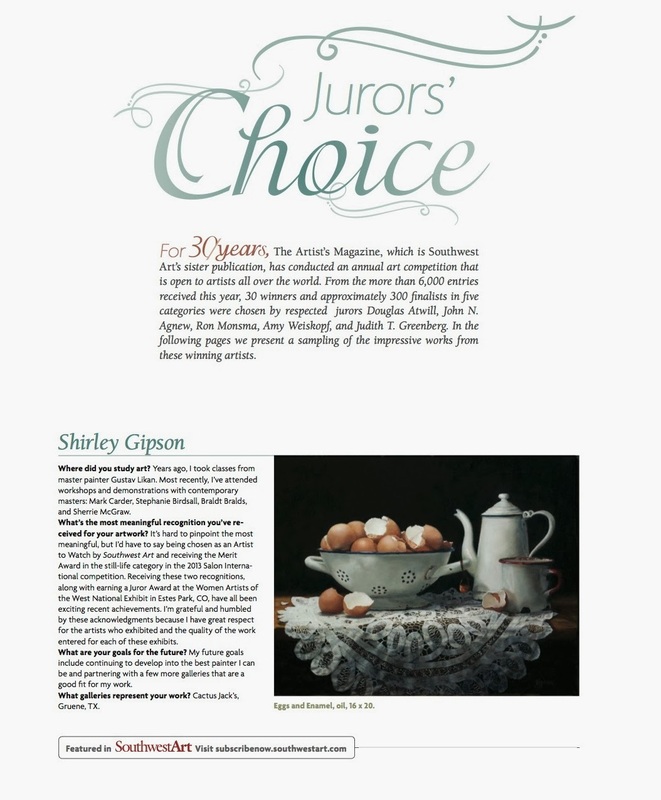 I've posted a picture here...I'm also thrilled to share that it was chosen (along with another one which I'll post soon) as a finalist in the 2014 Artist Magazine Annual Art competition ... with over 7,500 entries this year! When I paint clothe, I learn so much about values and how they impact form. 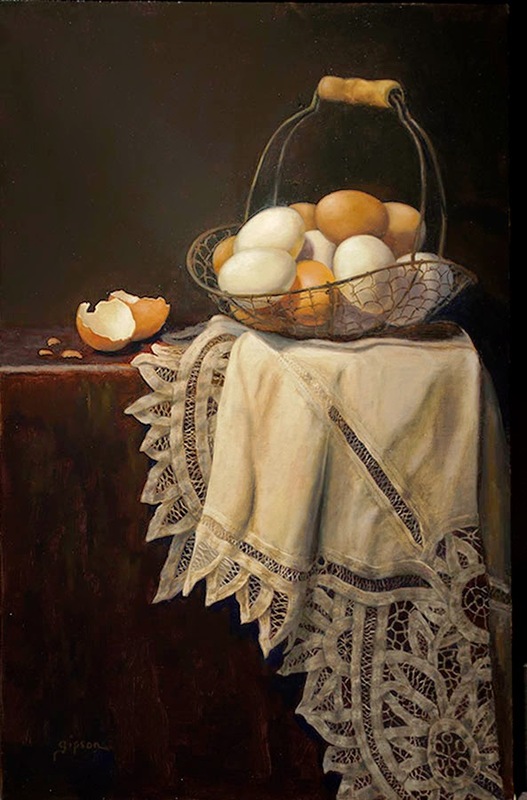 This painting pairs clothe with a basket of eggs - mixed browns and creamy whites. I used the chiaroscuro technique which I'm drawn to. I love the drama the shadows and light create with this method. I'm always amazing at how many colors are "hidden" in objects we tend think of as being pretty much just one main color. 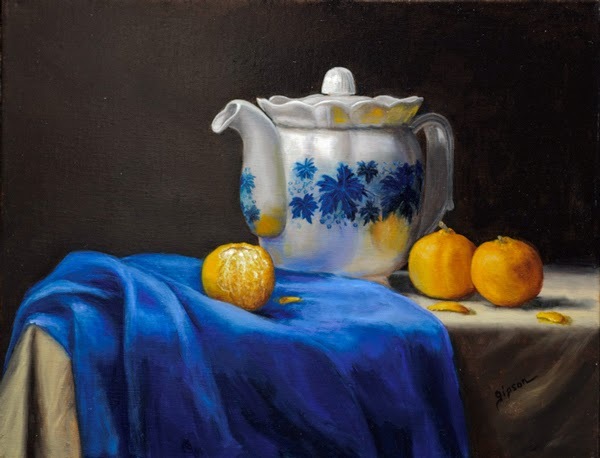 When painting lemons for this piece - it provided the color surprises I've learned to look for in my still life set ups. 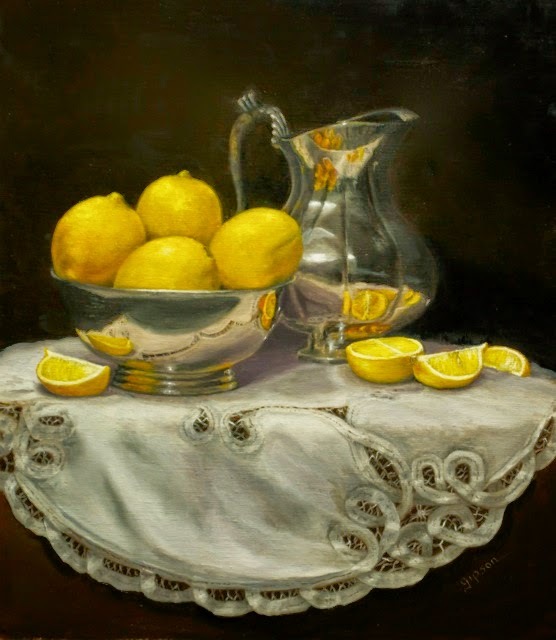 When matching colors for both the lemons and silver, I discovered shades of mauve, lilac and red along with various shades of yellow. It's been a few weeks since my last post and I wanted to post some new work I'm recently completed. I hope to keep a better handle on tis blog in the upcoming months. Thank you for your patience with me! Here is the first of several. The book ends were found in an antique store. I hadn't seen any like them before so they caught my eye...most of you know, I love the unusual and unique character of old things. They alone inspire me...:). The antique trinket box was a gift from a friend. The results of this years selected entries for the 2014 Salon International are in! I'm pleased to announce that "Embroidered Treasure" has been selected to be a part of the exhibit! There were 980 entries of which 214 were selected. 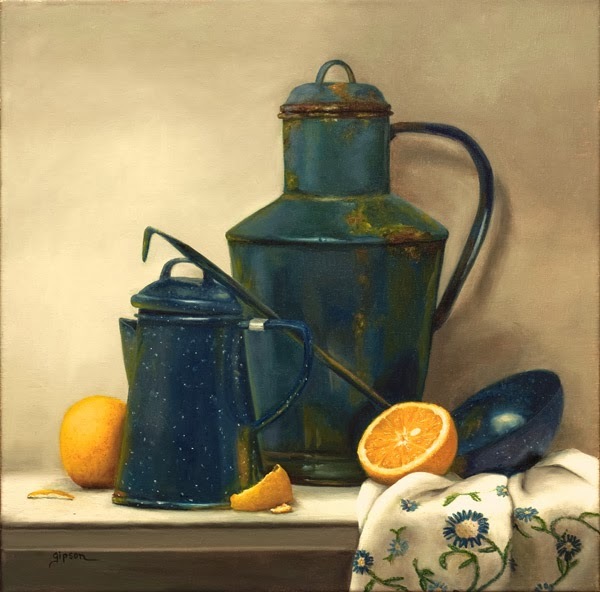 This year's presiding judge will be Master painter David Leffel! 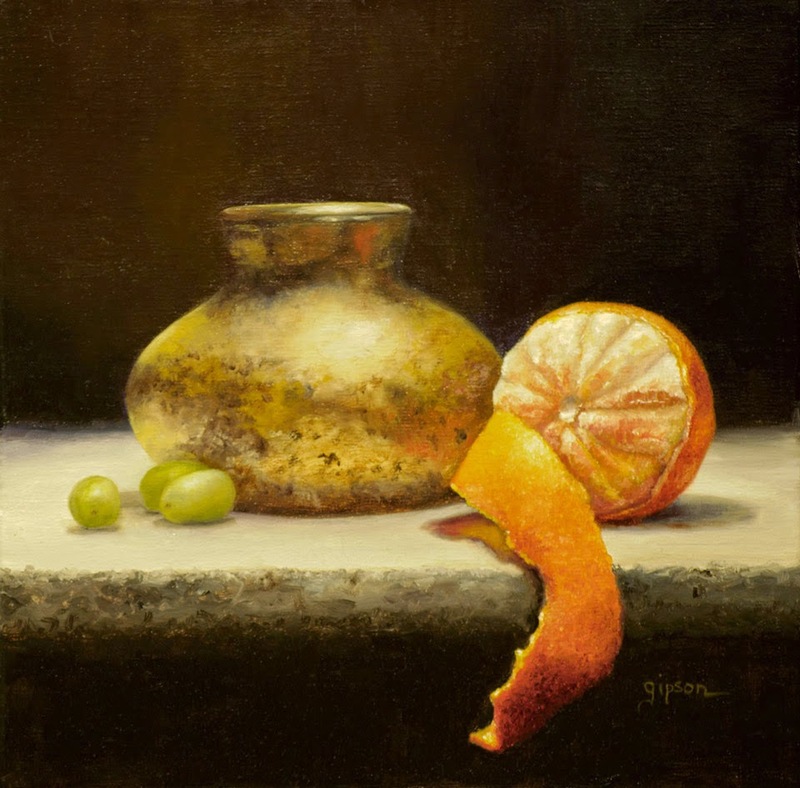 The Salon International is held at the Greenhouse Gallery of Fine Art in San Antonio, Texas. I'm thankful it isn't far away for me and I hope to attend the awards dinner again this year. It's always great to see the staff and the entries which are always better in person. Max Ginsburg and me with "Eggs and Enamel"
Get notified when new art arrives.